Former BPD Chief Jan Noble stands by the squad car we have all become familiar with. Current BPD Chief Shane Woody stands by the newly redesigned squad car. 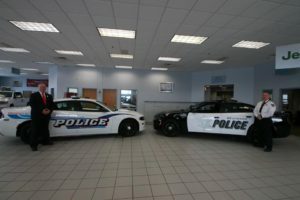 Belvidere Police squad cars are getting a new look which features black paint on the front and rear of the car, a new blue and silver font, and the department’s badge on the side doors. “We are excited about them,” says Belvidere Police Chief Shane Woody. “It has been discussed during conversations over the years in which the majority of the BPD officers wanted to go to a black and white design. “This decision was a collective effort. The BPD command staff, sergeants, and officers gave input about the design and the officers voted on it. They had the final say on the design. “It is a stark contrast between the old and new looks. This new design is very professional looking and we are happy with what was chosen. We are considering whether to retrofit existing squad cars with the new design or wait for the older cars to be replaced with new vehicles carrying the new design. We are keeping the cost factor in mind and that decision has yet to be made.